Let's talk about the yarn stash. Everyone has one (and no I don't believe those people who say they don't). 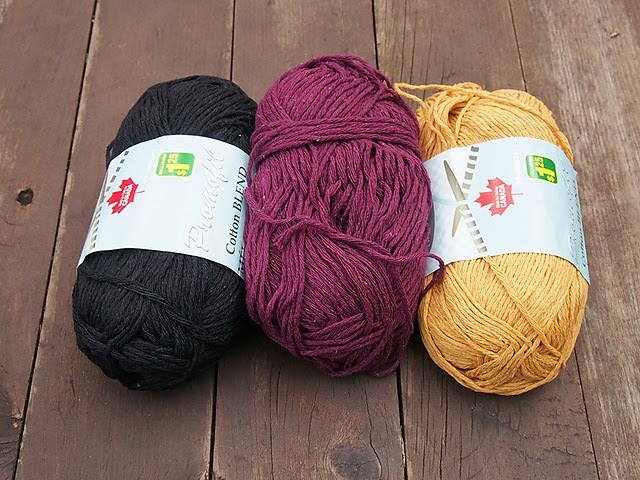 My stash is made up of four different types of yarn: the splurges/urges ($$$), the oh-my-god-this-is-on-sale-I-must-buy-its ($$), the this-is-so-cheap-and-questionable-and-I-really-shouldn't-buy-it-but-I-wills ($) and the one-knitter's-trash-is-another-knitter's-treasures (free!). 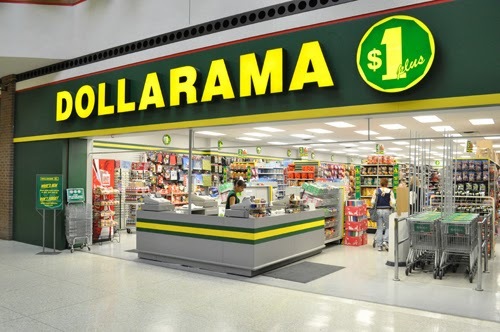 Here's a story about my yarn from the Canadian dollar store chain, Dollarama. These are so awesome, I got mine at Knitpicks. I was intrigued by the so-called "Promofil Cotton Blend", which felt like mostly cotton (as I ripped into the bags at the store) in squeakiness and weight. In fact, this stuff is actually a tweed, with flecks of, let's call it... "unknown fiber". I'm not afraid to say it: I love a dirt-cheap bargain. 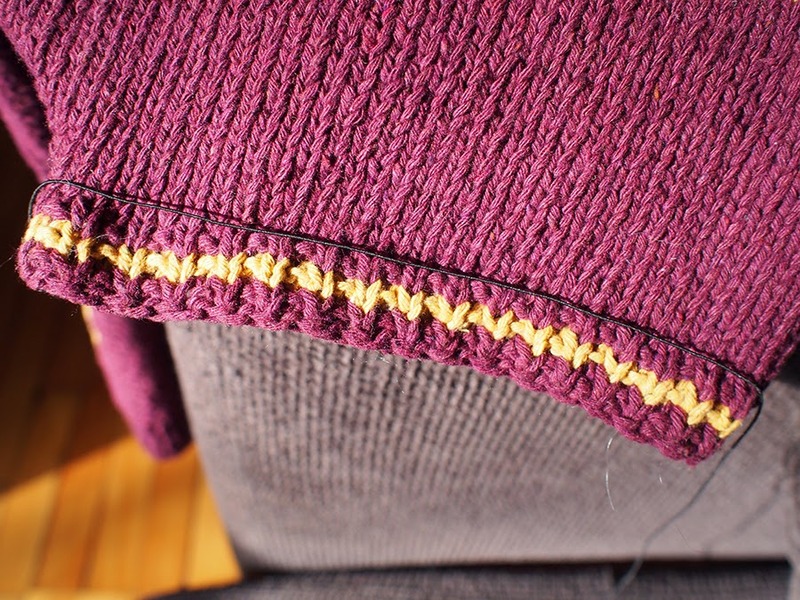 I KNEW this wouldn't be the greatest yarn, not close, but just because it was cheap and had a lot of cotton, I started casing out stores all over Montréal to stockpile the magenta and mustard colors. You see, they usually receive a box with a bag of all different colors, at most two of the same one in a bag. So you have to be crafty. I even found a cardboard box in a storage area of the store and ripped it open to find more, shhh. 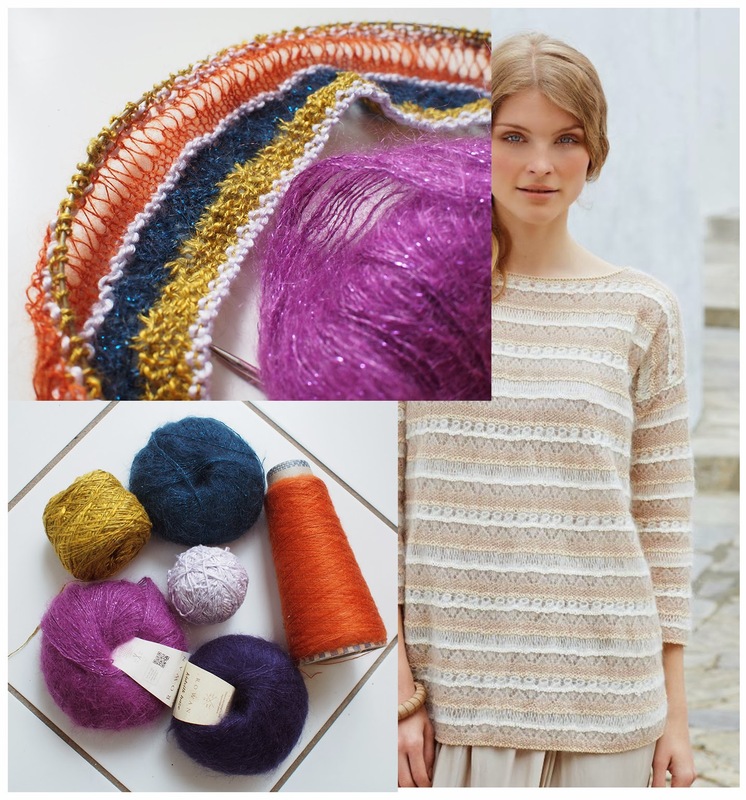 As usual with stash, I didn't have any plans for the yarn until I saw the new Spring/Summer Rowan Mag 55, which is chock-filled with stripey cotton knits. So, you know what I did? I just flipped through the mag until I found a yarn that had the exact tension as my Dollarama yarn! The winning match was Rowan Handknit Cotton, and I had three options. Sarah Dallas's Boardwalk was cute but too cropped... and what's with all these huge sleeves, really? But Lisa Richardson's Sally looked like fun. And it was... I highly recommend this pattern. 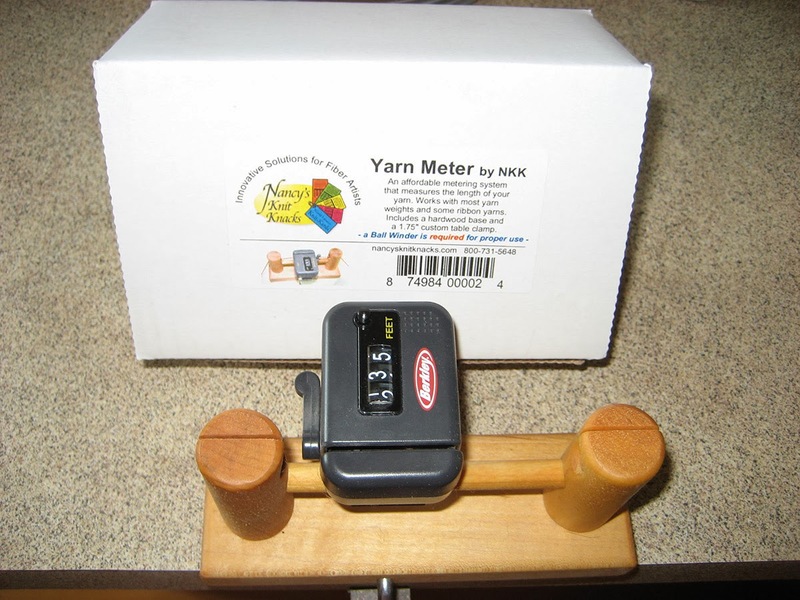 It's fast because of the worsted weight yarn, and very entertaining. You knit sideways from sleeve to sleeve. 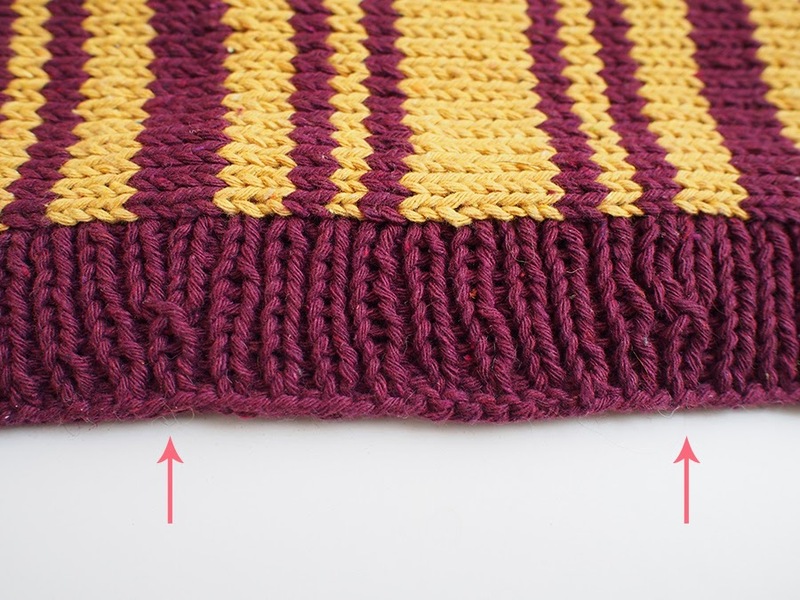 NOTE: When knitting side to side, remember it is the row tension that matters for once, NOT your stitch tension! 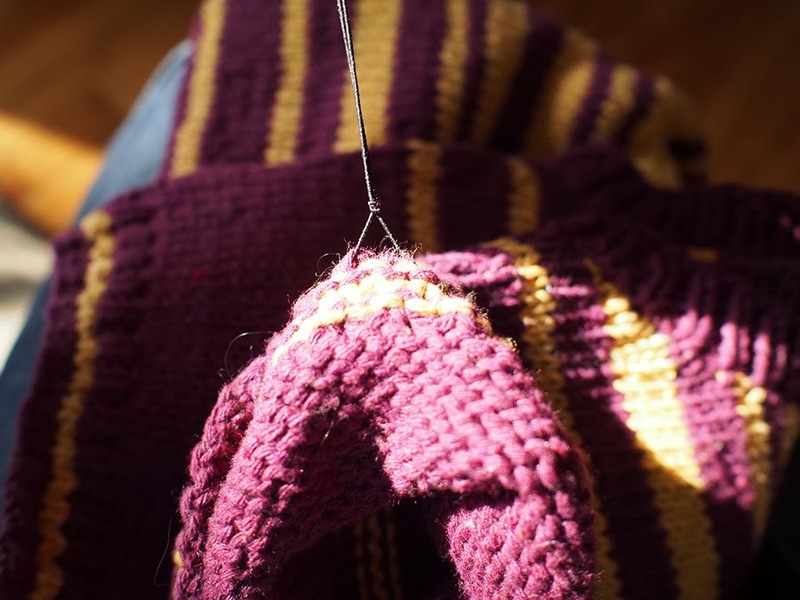 Knitting side to side usually results in a boxy shape, but the pattern is clever and includes short rows to shape the waist. In retrospect, I should have created my very own unique barcode instead. As usual, I made a few mods. I didn't like the striped collar and hem, so I made it solid. 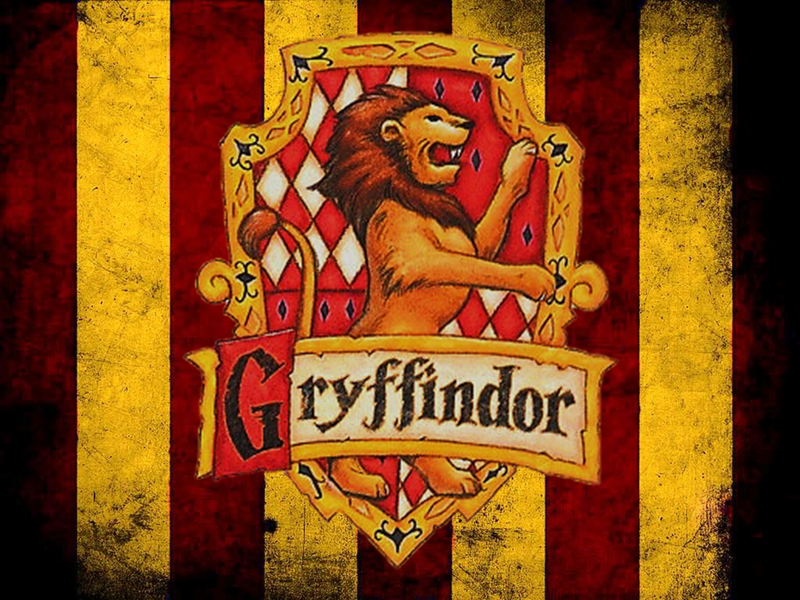 Those stripes had too much of an athletic feel with the colors I chose. Then there were really too many stitches picked up at the hem, it was far too floppy. 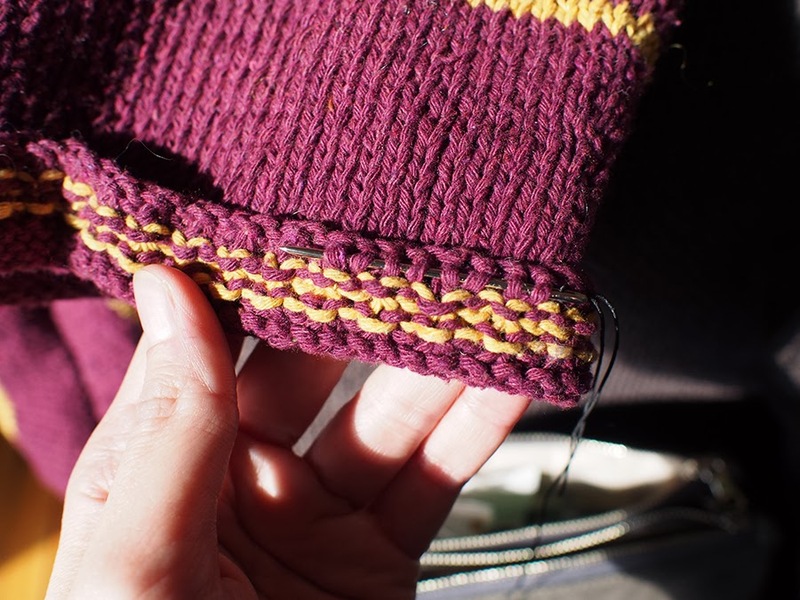 So lazily, instead of picking up less, I decreased 24 stitches (by sk2psso to keep the 1x1 rib) evenly around after 6 rows of ribbing. I like it, the decreases are almost like little cables. After the photoshoot I realilzed I was annoyed with my sleeve "corners", and I kept trying to push them down. Well, that's a big alarm bell for me, I hate repeatedly fixing anything I am wearing. I took some elastic thread. And wove it through the hem, making a knot and gathering it. 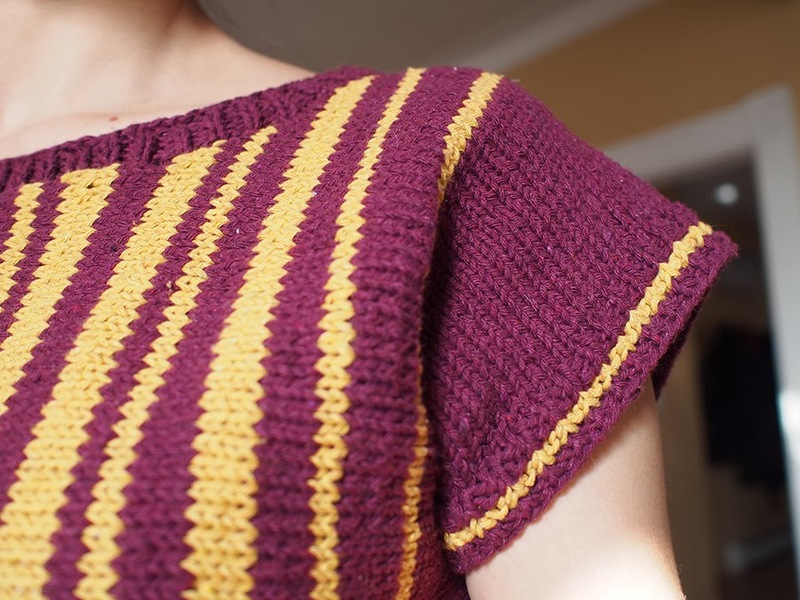 This was a lighting-fast knit, and Dollarama petroleum yarn or not, I'll definitely get some use out of this $7.50 top. 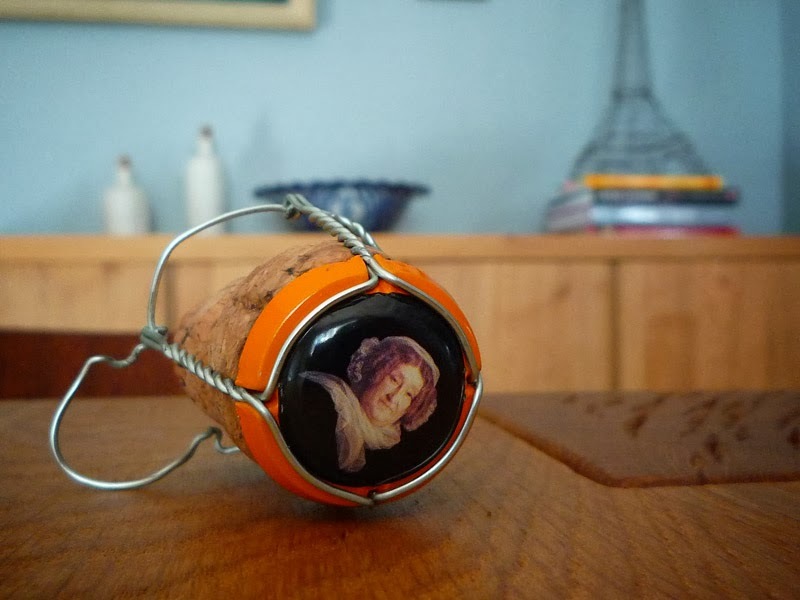 But to offset the price, I pair it with my Veuve Cliquot earrings, made by my husband from two very special bottles of champagne (by the way, it is $72 per bottle in Quebec, and $42 in New Orleans!! grrrrrr). 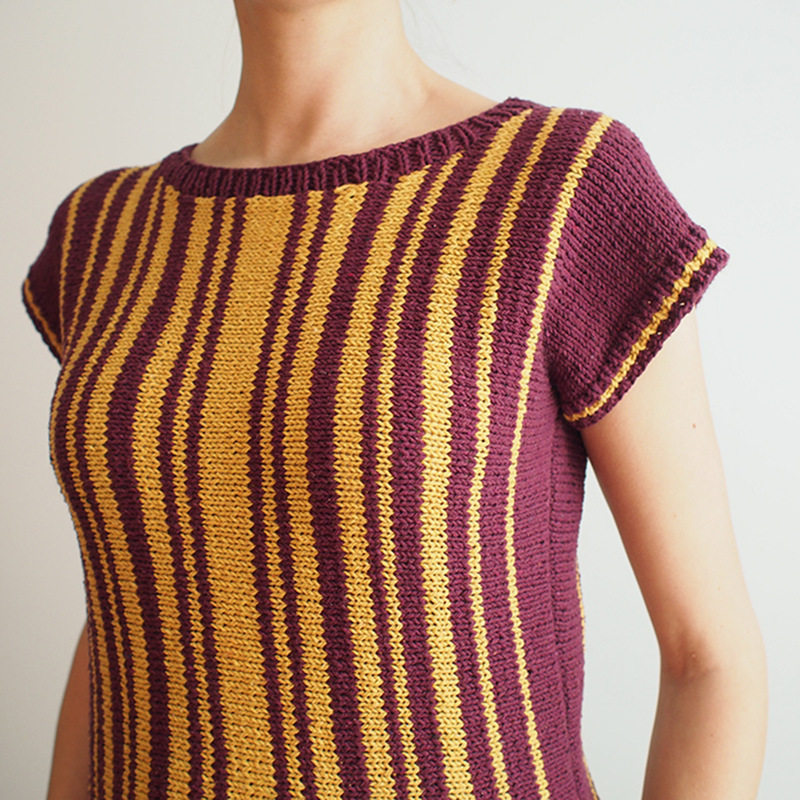 I have made a few other incredibly cheapo knits. But stay tuned for the splurge/urge ($$$) part of Mag 55, it's coming, too! 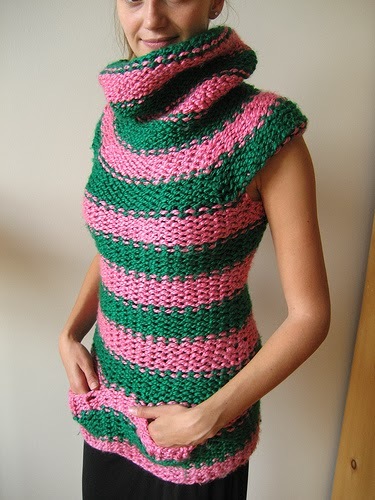 Another brilliant knit. I don't expect anything else from you now! Oh no, I might be raising the bar too high! ;) Thanks! Love those colours on you! You'd never know to look at it how cheap the yarn was! Does it feel soft enough to wear next to the skin? Yes, it is perfectly fine to wear on the skin. I'm impressed, actually. Now, I have yet to wear it all day, as it's the middle of winter. I will say that the smell is petroleum-y, and I'm not sure if it will come out. I'm afraid to wash it, as it might bleed? Gosh, looks so great on you! Love!! Can't wait to see your Wharf sweater. Those colors you've chosen are so beautiful! 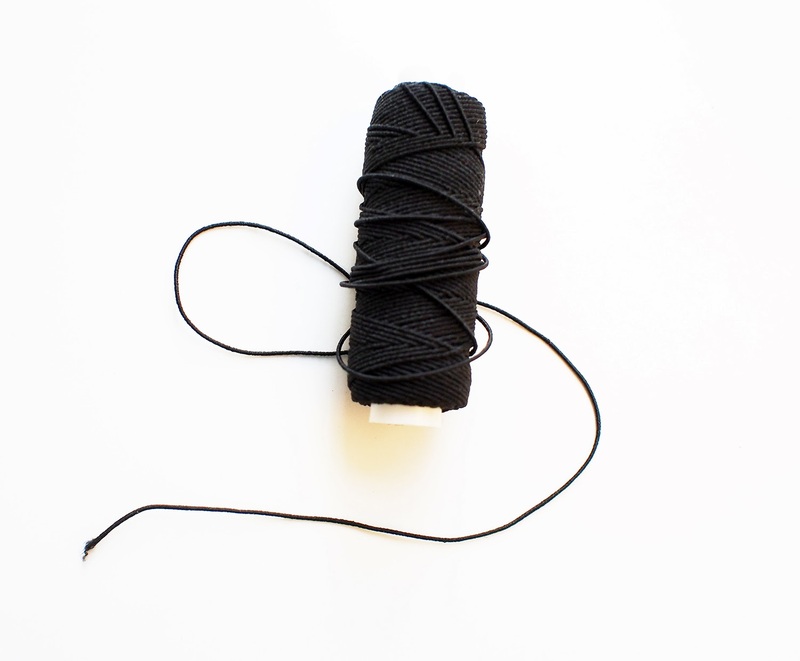 Will you give us a sneak peek and share with us what brand of yarn you'll be using? I'd be happy to give a sneak peek! These days I've been publishing all sorts of FOs because I have a backlog, but eventually all I will be able to show is WIPs. It's madelinetosh merino light! AND IT'S GORGEOUS. Thank you! I must admit, the bottles of champagne were consumed on separate events. :) Better that way, or you won't taste the second, haha. It looks so great! So smart! 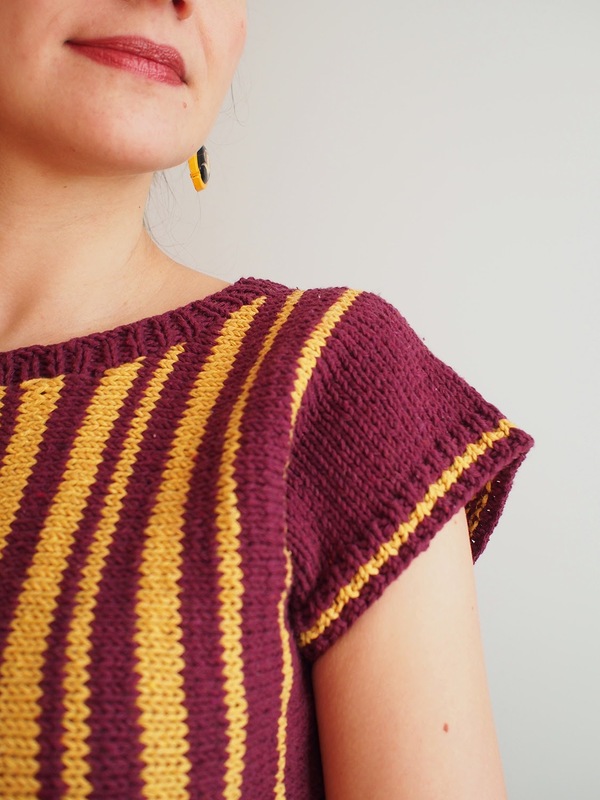 I've only recently began knitting warm weather knits and have found the price tag, even for fancier yarn, so much easier to justify. I also find that I wear inexpensive knits frequently because they seem so indestructible. I don't worry about ruining silk, etc. Such a good comment. YES, I find that I am more comfortable pulling a cheaper project, or more washable wool out of my closet. I have some delicate stuff that snags, or is slippery enough to fall off onto the dirty road, or just so difficult to wash that I don't bother. There is a bargain niche that is really quite important! 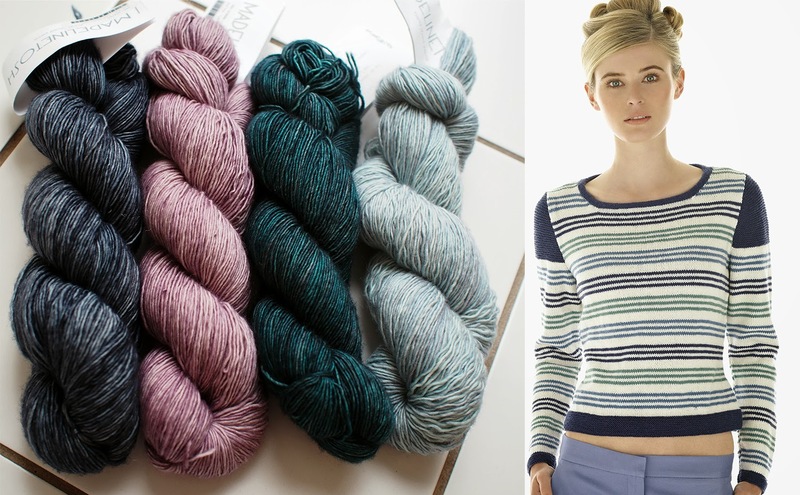 And I also agree that summer knits are a great way to try out a more luxury yarn for less cost. Actually, in my opinion, a lot of luxury fibers should never be sweaters, as they often pill (baby alpacas) or snag (silks) or grow (all of the above! ), etc. I like knitting a sweater side to side. For once, it usually fits right, although I can't knit it longer if I later decide it needs a little more length. This pattern is really cute and I love your colors. Your posts are always informing. This is my second side to side knit and it certainly was fun. 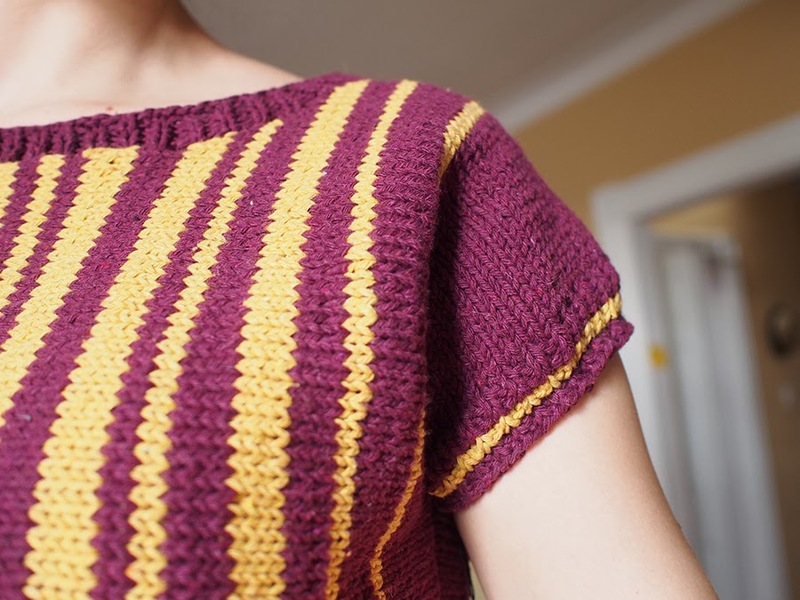 You know what else I realized, a lot of people can't wear horizontal stripes, and the only way to get slimming vertical stripes the conventional way is intarsia. 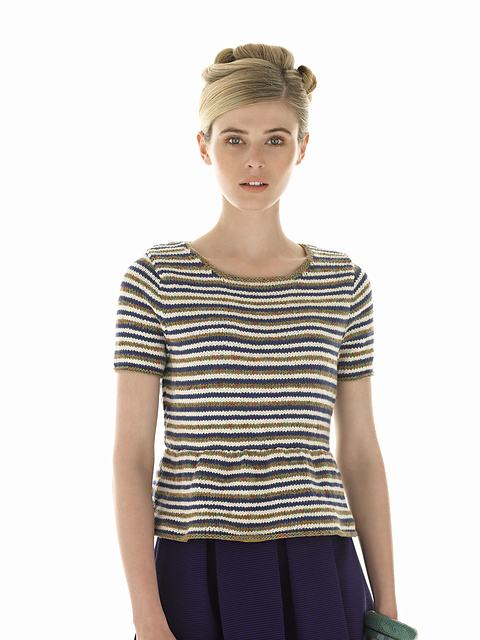 This is a great way to get easy vertical stripes! Ah, I haven't gotten around to looking closely at the pattern yet, so I wondered if the stripes were on the back as well. I love what you did with the elastic thread - I should get myself some as I think the sleeves look so much better. Still debating which colours to use, but I think I'll be casting on for this soon. God, you knit fast! I'm very glad you'll be making one (and showing us in the KAL on Rav, hee hee), I'm sure you'll really enjoy it. 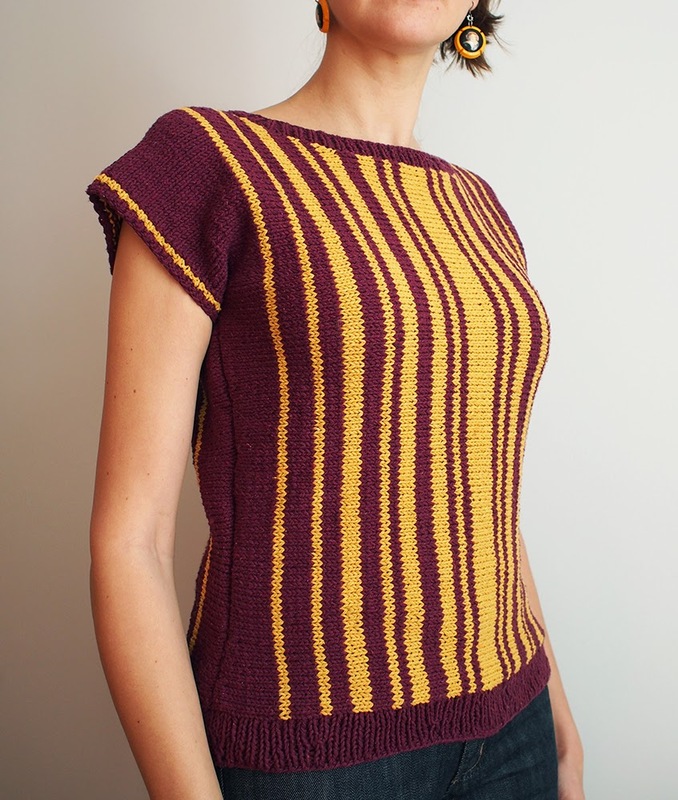 The stripes sort of have to be on both sides because past the neckline you actually knit the entire piece from front to back. Okay, full disclosure time. 1) It does smell like something from the Dollar Store. I'm working on it. /praying?/ 2) My husband *forces* me to have a stockinette (or rather easy) project at all times so that I can watch movies with him. The problem with this is that I finish them too fast, and that becomes expensive. See #1. 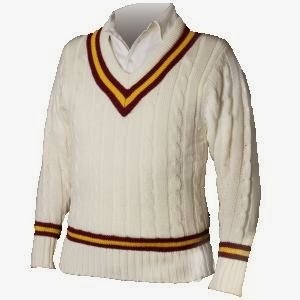 I had to laugh at your "athletic sweater" comment - you picked exactly the colors of my grandfather's alma mater. "Oh, we'll root for Minnesota, for the old maroon and gold". . . YES! When I was trolling the web for pictures I started off with a whole slew of Minnesota jerseys -- and couple of Redskins ones, too. Glad to give you a chuckle, stashdragon! The Madonna will be kinda crazy. But the Wharf will be a jaw-dropper, just you wait! Dayana, this sweater is amazing! I can't believe you got this yarn at Dollarama. I have recently started following you and assumed you spent a fortune on all your sweaters (not that there is anything wrong with that!) I am very impressed that you were able to make this for $7.50. Oh goodie, I love fooling the masses! I have *all manner* of yarn in my stash and never pass up a freebie. I am a crazy enough knitter that I've decided that I can never waste time on something. If it's cheap and I don't like it, I throw it out. At least I got some entertainment value! That's a fabulous sweater! Actually, you've knitted tons of fabulous garments. Thanks for commenting on my blog. Your comment led me to your blog, and it's on my blog roll now! That is a great top! So flattering and I love the colors. I love side to side knitwear. Thanks! I saw you were taking a blogging break to solidify a thesis project topic... best of luck to you, I remember what those days were like! I am just knitting something too, but after doing 2 colors, I notice it says to "not mix colors in same knit" Oh well. Too late. US 6 - 4.0 mm for the body. Enjoy this knit!